Victoria Square – Sidock Group Inc.
Project Size: 79,000 sq. ft. 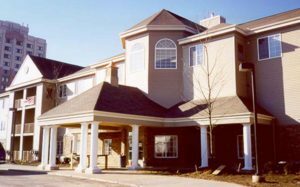 The main lobby of this 3 story, 86 unit, complex features a 2 story atrium with a grand staircase, fireplace and chandelier. Amenities include laundry rooms, medical consultation rooms, craft room, game room, library, mail room, dining room, kitchen, and carports. The restrictive site required extensive planning and coordination with City officials.